Military personnel are frequently deployed to regions of the world with high travelers’ diarrhea (TD) rates. Pathogens associated with TD have been linked to several post-infectious sequelae, including functional gastrointestinal disorders (FGD), such as irritable bowel syndrome (IBS) and functional dyspepsia. Furthermore, stress associated with deployment may potentiate the increased FGD risk. We sought to assess whether self-reported diarrhea, vomiting, and stressors during deployment were associated with increased FGD risk. 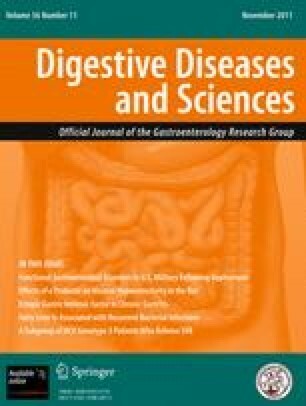 Using active duty military medical encounter data from the Defense Medical Surveillance System (DMSS), we conducted a matched case–control study to assess the odds of FGD (IBS, functional constipation, functional diarrhea, dyspepsia) following self-reported diarrhea or vomiting during deployment. Only first-time deployers with detailed self-reporting of deployment-related exposures from 2008 and 2009 were included. Univariate and multivariate analyses were performed. A total of 129 cases of FGD were identified, with the following distribution: constipation (n = 67), dyspepsia (n = 15), IBS (n = 22), and overlapping disorders (n = 25). Diarrhea and/or vomiting during deployment were significantly associated with the development of FGD. Other demographic factors were also associated with variable risk. We found no consistent effect of war-related stressors or non-combat-related correlates of stress. Deployment-related TD is common in deployed military personnel and is associated with an increased risk of several FGD. When considering effective countermeasures and mitigation strategies, both the acute effects and chronic sequelae of enteric infections should be considered. Increased emphasis on existing and novel primary prevention strategies are needed, as well as outcome studies among those developing these conditions. Disclaimer: The views expressed in this article are those of the authors and do not necessarily reflect the official policy or position of the Department of the Navy, Department of Defense, nor the U.S. Government. Copyright statement: The authors are employees of the U.S. Government and military service members. This work was prepared as part of official duties. Title 17 U.S.C. §105 provides that ‘Copyright protection under this title is not available for any work of the United States Government.’ Title 17 U.S.C. §101 defines a U.S. Government work as a work prepared by a military service member or employee of the U.S. Government as part of that person’s official duties. Statement of Linda J. Bilmes. House Committee on Veterans’ Affairs Full Committee. http://veterans.house.gov/Media/file/111/9-30-10/111-103transcript9-30-10.htm#bilmes. United States Department of Veterans Affairs. Office of Public Health and Environmental Hazards; Gulf War Veterans’ Illnesses: Infectious Diseases. 2010; Available from: http://www.publichealth.va.gov/exposures/gulfwar/infectious_diseases.asp.